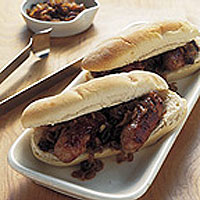 Waitrose Organic Pork Sausages come from pigs that are reared on organic land and fed an organic diet. Bring out their flavour by serving them with this delicious relish, which is also made from organic ingredients. Eat with bread or creamy mashed potatoes. During May you will also find some unusual sausages in our sausage fair on the meat service counter. Make the relish by heating the butter in a large saucepan until melted and foaming. Add the onions and seasoning. Reduce the heat then cover and cook for 15 minutes stirring occasionally until beginning to soften but not brown. Add the sugar, beer and raisins and continue to cook uncovered for a further 15 minutes until the onions are meltingly soft and golden and the liquid has reduced and is syrupy. While the relish is cooking, preheat the grill to a medium heat. Place the sausages on a rack under the grill and cook for 10-15 minutes, turning occasionally until golden brown, thoroughly cooked and the juices run clear. The skins of Waitrose Organic Pork Sausages do not need piercing before or during cooking. They are made from natural skin which expands while cooking, so the sausages will not burst, but will stay juicy. The relish stores in the fridge in a container with a tight fitting lid for up to one week. You could easily double the ingredients to make extra. It is delicious served with cold meats, barbecued chicken or roasted fish.